Baskets are among the most ancient of human artefacts. Everyone is familiar with their most common functions as containers for transport and storage. 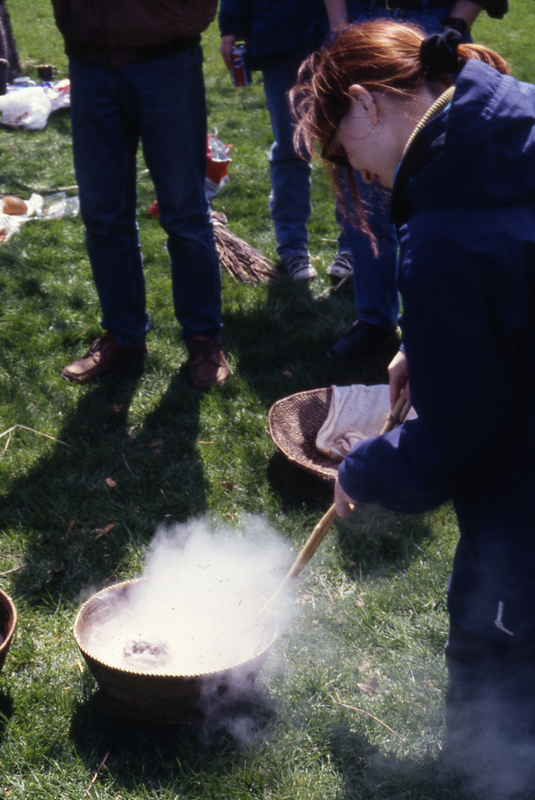 When told that baskets have also served as cooking vessels, most people will be unable to conceive of how this is possible, yet this was a primary function of baskets for many cultures of the past, and some until the present. The surprising key to this method is in the use of hot rocks, which cook the contents of the basket quickly and efficiently without charring or damaging the container. Though baskets are discussed here, the technique is transferable to any organic container, including those made of bark and leather (Nelson 2010). My cooking rocks have been used over and over again and are still undamaged. In experimental situations using unknown rock types I would always recommend eye protection. 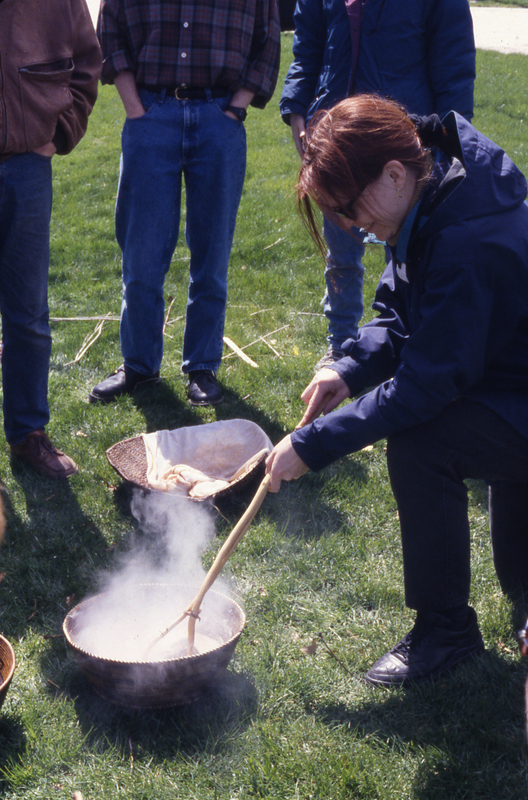 In my course on the technology of materials in the Art Conservation Department of Buffalo State College, I talk about, and sometimes demonstrate, this ancient cooking technique. I want to make my students aware that Eastern American Indians used the method until relatively recently, and that some groups of California Indians still do for community occasions. Almost certainly the method was used by ancient Europeans as well. The Fulacht Fiadh of Ireland, also called ‘burnt mounds’ in the rest of the British Isles, consist of semicircular piles of heat-cracked stones surrounding a central pit. Often mentioned in ancient literature, the name is old enough that its etymology is uncertain (O’Drisceoil 1990, O Brien 2012). The stones were almost certainly used for heating water, though what the water was used for- cooking, bathing, dying or brewing is still debated. Quite possibly all of these activities were carried out at the sites, which are the most common archaeological features in Ireland. I was first shown how to cook with hot rocks about twenty years ago by Craig Bates, then Curator of Ethnology at Yosemite National Park. Craig is an expert on the crafts of California Indians, particularly the Mewok Nation, a Native American tribe that he had married into. In demonstrating the technique to my students I use coiled baskets of tight construction that hold water well, particularly after the fibres have swelled by soaking. Baskets that have been previously used for cooking are additionally sealed by cooked starches that fill the interstices and swell when the basket is wet. The choice of rocks is also important, and some cultures went out of their way to secure the best ones, using them over and over. At “Head-Smashed-In Buffalo Jump” in Alberta Canada, archaeologists determined that ancient Indians had transported suitable cooking rocks over considerable distances because the sandstone locally available was unsuitable for large-scale cooking of Bison meat (Brink and Dawe 2003). Another researcher did comparative studies of various stone types and found that of those tested, quartzite worked best (Thoms 2009). The stone types used in Fulacht Fiadh have also been characterised by Buckley (1990). I use vesicular basalt, as do the California Indians in the Yosemite area. Basalt is a dense black volcanic rock with a high metal content. 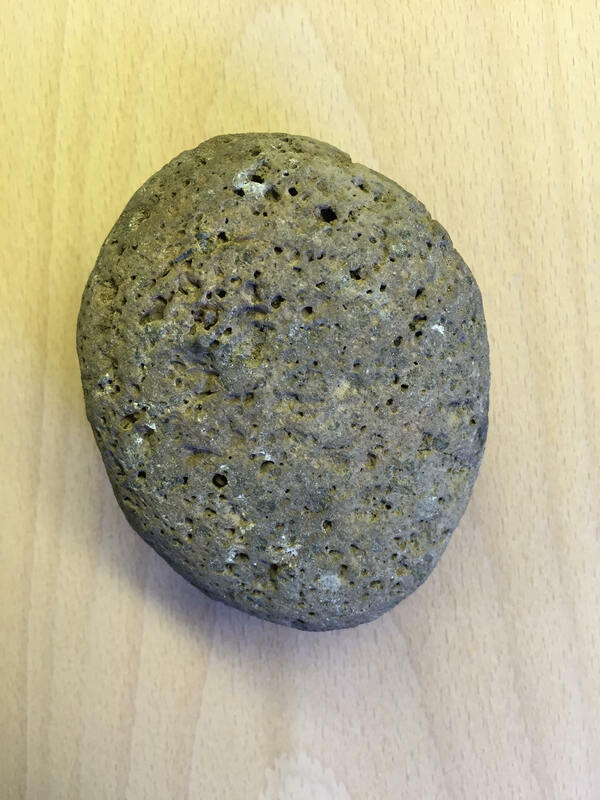 Vesicular basalt is a type that includes many air bubbles as a result of the expansion of dissolved gases at the time of eruption. The bubbles, and the tubular passages caused by gas release create a high surface area for heat uptake and transfer. The sponge-like structure also reduces the risk of thermal shock which can cause stones to shatter explosively when they are introduced into the fire or cooking basket. Steam is generated throughout the channels in vesicular basalt and not just at the surface. Interestingly, this type of rock is used for the heating stones in saunas, and for the same reasons. My cooking rocks have been used over and over again and are still undamaged. In experimental situations using unknown rock types I would always recommend eye protection. Two types of tools are used by California Indians, both made from bent green wood. The rock handling tool is a flat strip of timber that has been bent in the middle of its length like a pair of tongs. It is used to put stones into the fire and to retrieve them for cooking. Two long sticks can be used like chopsticks, but they are harder to manage if they are not joined together on one end. The stirring tool is made from a round green shoot that is bent in the middle into a loop resembling a spoon and lashed together where the ‘bowl’ meets the handle. The aperture of the loop part is small enough so that the cooking stones do not fall through. This tool is used to move the stones around so that they do not dwell in one place and damage the basket, though theoretically, the release of steam around the stone will control the maximum temperature. In demonstrating the technique, I cook acorn ‘porridge’ as do current California Indians. The acorns have previously been dried and ground to coarse flour, then soaked repeatedly in changes of water to remove the bitter, but water-soluble tannins. 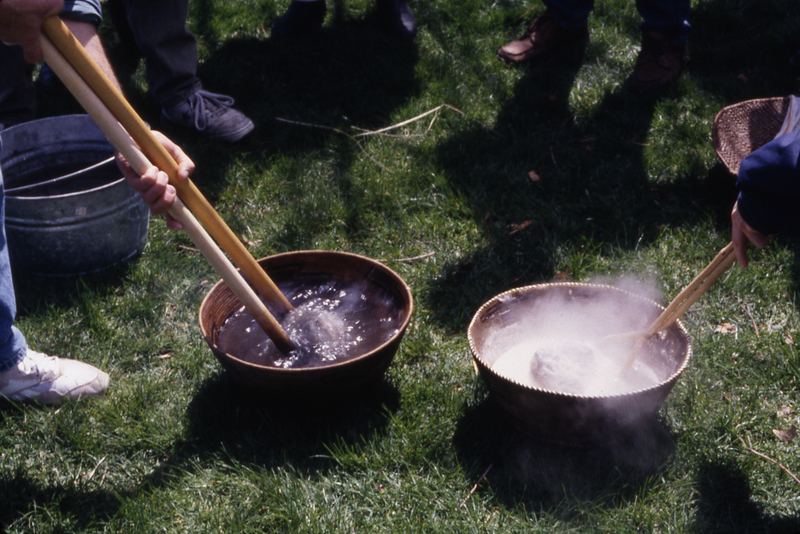 The acorn flour is then mixed with water in the basket. The cooking stones are heated in the coals of a fire. When they are judged to be hot enough, the tong tool is used to remove a stone from the fire. The rock is quickly dipped in a basket of plain water to rinse off any ash and grit. As Craig said: “American Indians dislike grit in their food as much as anyone else does.” It is then put into the basket and stirred with the stirring tool. Superheated steam rising through the contents of the basket produces a rolling boil very quickly, and the contents are mixed by the boiling. Once the boiling stops, the rock can be replaced by another, but acorn porridge can be cooked in one basket by one fist-sized rock, since so much heat is stored in it. Acorn porridge is bland though nourishing. My students do not necessarily appreciate the dish, but they always enjoy the demonstration, and are always surprised by it. BUCKLEY VM. 1990: Experiments using a reconstructed Fulacht with a variety of rock types: implications for petromorphology of FulachtaFiadh. In Burnt Offerings. 170-172. BUCKLEY VM, EMER E (eds). 1990. Burnt Offerings: International Contributions to Burnt Mound Archaeology. Wordwell Limited. Dublin Ireland. O DRISCEOIL, D A. 1990. "Fulachtafiadh: the value of early Irish literature". In Burnt Offerings. 157–164.